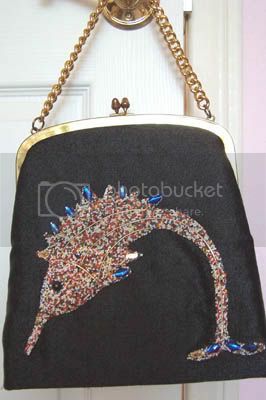 Black Purse with Fish Motif. 1960s. Maker: Jolles Junior. 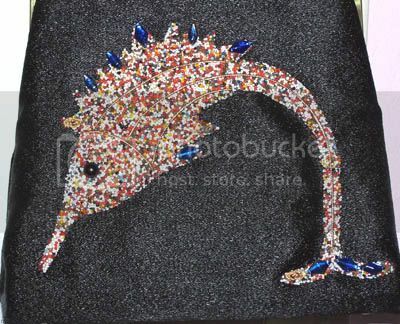 Fabulous black cloth bag with a three-dimensional fish—looks like a marlin, but I’m no ichthyologist—made of hundreds of colorful seed beads and blue faux gems. Also has a black glass eye and gold trim accents. The purse's fabric is textured and shiny (I LOVE SHINY!) and it has a goldtone chain handle. Jolles made a lot of these creatively-themed purses. I’ve seen poodles and flowerpots and pineapples. This is my first marlin. Or whatever the heck it is.